Let’s get right to the point. The level of professionalism and quality of services is not that high on Fiverr. After all, people feel robbed doing too much for five bucks. Most of the gigs I see are nothing spectacular with the worst part – representation. I cannot even begin to stress out how important the representation of your gig is – after all that is what makes the visitor click the “order now” button. And yet, we still have a ton of people wondering and complaining why they are not getting any sales when, in reality, their services are light years away from looking like a decent Fiverr gig. Making money on Fiverr is all about quality of service, but if you do not have great representation of said service, you still won’t get any sales. This tutorial will teach you, step by step, how you can create and promote a gig that would actually make you some money from the five bucks platform. Let’s get to the ladder. Creating a professional-looking and quality Fiverr gig – everything from the video and images to the gig title and gig description must be flawless and unique. Of course, if the service you provide is not something amazing, it doesn’t matter how well you represent your gig – the negative reviews will destroy it. So, first of all, coming up with an amazing idea for a service is the number one priority. Promoting your Fiverr gig – sitting around waiting for Fiverr to drive tons of traffic to a brand new gig is just another word (sentence) for laziness and/or unawareness. Let me put it this way – you can have the best damn service on Fiverr, but you will still get a relatively low amount of orders (in the beginning) if you do not promote your gig using the strategies I will share with you in this tutorial. And that’s it. Just these two simple steps will make you a lot of money from Fiverr. However, there are a lot of little steps in between, each of which is of vital importance. Let’s begin climbing the ladder towards your Fiverr success. Before we start creating the gig, I want to show you just how much opportunity there is on Fiverr. When we were starting out, we noticed that and it helped us to instantly start making money from Fiverr. What am I talking about? I’m talking about the countless threads similar to this one that I have seen and the fact that we have never opened such a thread – we were too busy with work. And so will you after you follow this step by step tutorial to the letter. Most buyers on Fiverr are from the United States, UK and other native English speaking countries – exhibit A. Most sellers on Fiverr do not provide high level of professionalism with their services. Those two simple factors apply to any niche on Fiverr and you have the opportunity to improve on that – oh so much. Even the top rated sellers in each niche do not have perfected gigs – that is not to say their services are bad. There is a huge difference between quality of service and gig representation on Fiverr. The first one is clear – if you ever want to make it on Fiverr, you need to do more than your competitors are doing. It’s very simple. But you also need an outstanding gig representation. How do you think a native English speaker feels when they see that a gig’s title and description that are light years away from what we call flawless English? Not too good. Of course, that doesn’t make a huge difference when all of the gigs surrounding it have the same level of English (which is the current case on Fiverr), but imagine your gig right there in the midst – perfected to the letter. Now, that will create an outstanding impression on the visitor and they will most certainly prefer your gig over the others. As we already discussed in the how Fiverr ranks gigs post, reviews are the most important and it’s true. But, a stunning gig representation can make buyers on Fiverr prefer your gig over gigs with thousands of reviews – I know that from personal experience and it really does work. A perfected gig shows professionalism which is not that easy to come by on Fiverr and that gives your services a huge edge regardless of the number of reviews they have. If you ever wish to make it on Fiverr and not be one of the many “I can’t get any sales” thread creators, you need to follow the steps I’m about to share with you. We’ve set up the stage and you are now aware of the huge room for improvement currently existing on Fiverr. I didn’t want to give examples of any bad gigs, but if you take a look around Fiverr, you’ll see that what I said above is totally true. Now, let’s create the perfect gig. Just one final note, this tutorial considers that you have already decided on a niche that you will compete in and that you have already created, in your mind, amazing services to be provided to the Fiverr community. Now, all you have to do is represent them and make them popular. I am a big believer in the “there is no better explanation than an example”, so this is what I’m going to do: I will tell you how we went about creating one of our gigs when we were starting out, which skyrocketed our Fiverr business – the legendary SEO content gig. 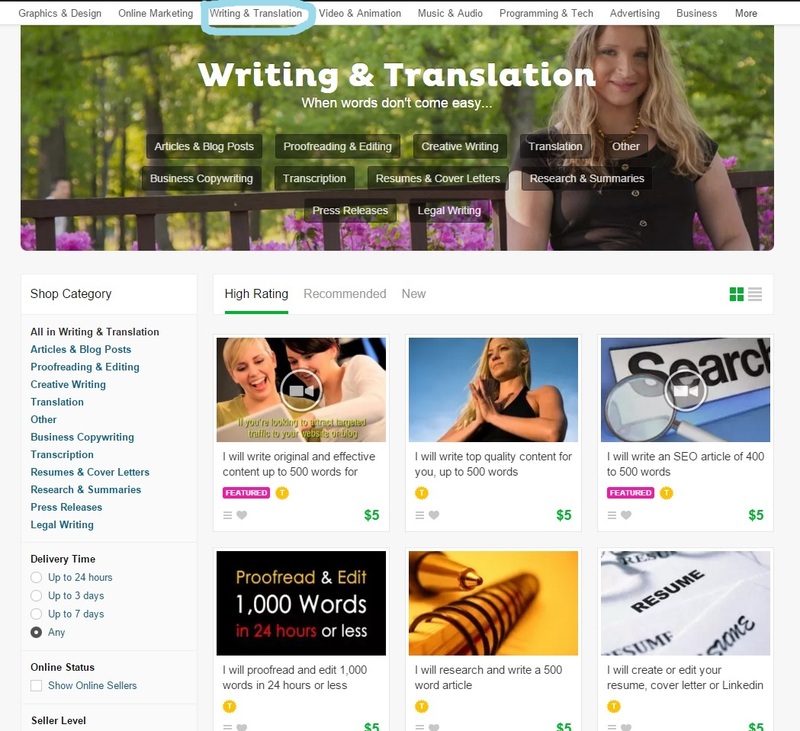 The writing niche is one of the most competitive ones on Fiverr as there are a lot of writers, but, it is also one of the most profitable ones. However, most of the content writers on Fiverr do not possess great writing skills. The next thing you need to look at is each individual gig in the top 10 for example. I have gone even further down, but the top 10 is a great start. Look at the gig titles, latest gig reviews, descriptions, tags, and profile about content and pretty much everything there is to a Fiverr gig. What are you looking for? Grammar mistakes anywhere in the gig content – this is a huge indicator of low levels of professionalism of the seller. Bad content styling – random bold words, chaotic indentations, weird characters, etc. Bad looking or at least not stunning gig images and/or video – images downloaded from Google, pathetic videos that look like they’ve been put together in about 10 minutes, etc. Recent bad reviews – this is a very important thing to look for because these best niche gigs might have been great once, but once they gathered enough speed, the official creator (who might or might not have been extremely good) probably got overwhelmed with work and started outsourcing it. So, there is a strong chance that the people currently performing the service which the gig provides might not be as good as the official creator of the gig, thus giving you the chance to show your skills. Overall stars – an average star rating of 4.9 or less is a strong indicator that the service provided by the gig is not very good or at least is partially spiraling downwards. Number of favorites compared to number of reviews – just as a general indicator. Number of orders in queue – a huge number of orders in queue most probably means that the seller outsources the work to questionable workers (might be great, might not be), so there is a chance that the level of service is not that great. Delivery time – everyone on Fiverr wants deliveries in 1 day, especially in the writing niche, so this one is a strong indicator of how quick the seller and their team perform. After building an image of the level of service provided by the top sellers in your target niche, you will be able to easily see what you can improve on and how you can do it. And that is absolutely critical to your success on Fiverr. You cannot do what everyone else is doing – there are already too many established gigs which buyers will prefer over yours. What you need to do is take your target niche to the next level – improve on already existing services by a lot if possible and you will see just how quickly your Fiverr business will grow. Another thing that you should do while you are researching your competition is to write down relevant keywords that you see a lot on each gig you check out. 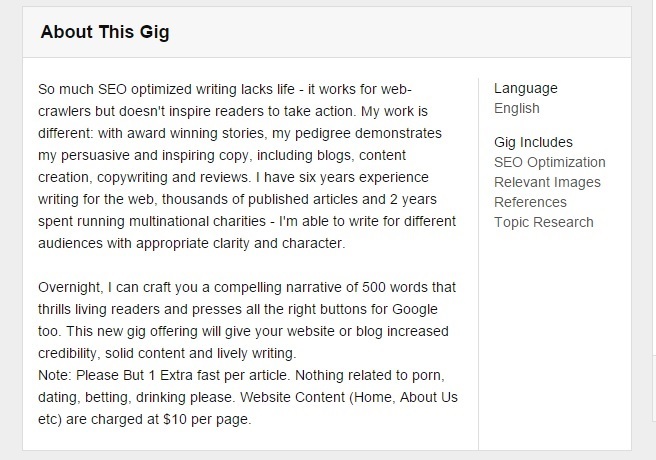 This includes keywords in the gig title, description, tags, and Fiverr profile about section of the creator of the gig. This will help a lot when we get to the keywords research which precedes creating the content of your brand new gig. Now, aside from performing the above niche research for the “High Rating” gigs column, you want to do the exact same thing, but for the “New” gigs column. This will show you what recently created gigs in your niche are offering and what you need to do to improve on them as well and surpass even the level of service they are offering – there is a good chance that the services in the “New” gigs column offer much more than the gigs in the “High Rating” column and you need to be aware of that. For example, when I was creating the legendary SEO content gig, I saw that there were new gigs offering up to 3,000 words for $5. That is a factor that you need to consider when coming up with the overall service provided by your Fiverr gig. The niche research is the most important part of creating a Fiverr gig and without it, there is a huge chance that you would head straight to the forums looking for help. But, if you do it properly, you will become aware of just how weak the competition on Fiverr is and how you can easily improve on their services and skyrocket the chances of your new gig’s success. Before you actually get to writing the content itself, you need to know which keywords you must include in it – those are the keywords that you want your gig to rank for. So, how do you find these niche keywords? We already mentioned in the niche research step that you should be writing down the most used keywords in your competitor’s gigs, so this is source number one, which in many cases can be more than enough. Use Fiverr’s search input to get more niche relevant keywords that are most searched for. Use Fiverr’s tags suggestions when creating your gig. As you see, the most relevant keywords to the one we are targeting appear right below the 3 suggestions to search in Fiverr categories. So these 5 keywords that you see should go straight to your list of keywords to be included in the content of your gig. Analogically, you do the same thing for all of your main target keywords and you will end up with quite the keywords list. Of course, you won’t probably be able to include all of them in the content of your gig, so if you get to a point where you’d have to choose between keywords, opt-in for the ones that get more searches i.e. the ones that have appeared higher in the search input suggestions. From the example above, the most searched relevant keyword to “blog post” is “write blog post” as it appears the highest out of all five keywords suggested. And that’s basically it for the Fiverr keywords research. 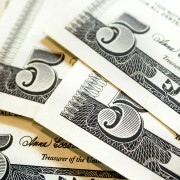 If you had read our article on the way Fiverr’s search engine works, you’d know that keywords are extremely important. So, make sure your list contains only the best ones in your niche which will give your gig a huge opportunity when the SERPs rotate. Now, the best keywords are also the most competitive ones of course, and the bad news is that Fiverr doesn’t have a Keyword Planner which shows you monthly search volume for certain keywords. So, finding gold nuggets in your niche is not that easy. You’d have to manually enter each keyword that comes to your mind, that might have a decent search volume and yet not too much competition. For example, if you search for the keyword “copywriting”, you’d see that there are only two gigs in the top 10 with more than 1k reviews and that in the top 20 there are a dozen gigs with reviews less than 100 and even less than 10. Now, I don’t know if you are aware, but copywriting is an extremely searched for service, because after all, an outstanding copy can sell anything. So, with this example, I wanted to show you a potential gold nugget on Fiverr which has yet to be claimed. And that’s basically the only way you can find these opportunistic keywords. The title of your gig is probably the most important part right next to the thumbnail of your gig, which will skyrocket or destroy your CTR. If you recall, the SERPs of Fiverr show only the thumbnail of the gig and its title. But, there’s a twist. The gig title is cut if it is too long. How long? Well, I have noticed that Fiverr will cut the title at around 5 – 10 words depending on the length of each word. Basically, the title needs to fill 2 rows of 206px each with font size of 15px. So, your gig title must be straight to the point with no empty words in it. This is actually the only part of your gig where you can use not-so flawless English language, just because words such as “the”, “to”, etc, if possible, should be omitted. Fiverr allows a total of 80 characters to be used in the gig title, but again, you should aim to fit it into those 2 rows that would appear in the SERPs – at least aim to fit the most important part of the title in there. For instance, our high PR Web 2.0 gig is currently titled “I will 128 High PR Web 20s Link Pyramid 3 Tiers 5128 Google Safe”, but if we were to write it in flawless English, there wouldn’t be enough characters to get it done: “I will create 128 High PR Web 20s in Link Pyramid with 3 Tiers and a total of 5128 backlinks that are Google Safe”. See what I mean? Those words that can be omitted, but will still leave the title understandable to your target audience, should be omitted. You will also see that if you go over 60 characters, Fiverr will warn you that “Your gig title is a little too long. Short titles sell more!”. So, if I were you, I’d honor this warning. And there really isn’t a point in going anywhere near the 80 character limit anyway. Keep it short and simple. Now, as a new seller, up to level 2, you are allowed to have one uppercase word in the gig title. Make sure you use it wisely. For instance, when I was creating our content writing gig, I wanted to utilize this one uppercase word rule to the maximum. So I thought to myself: “What word would cause a Fiverr visitor to stop in their tracks and check out our gig?”. I came up with “LEGENDARY” since it just went with the flow – and it worked out great. Another great selling point to use in your gig title is numbers and more specifically, odd numbers. People love numbers and they just easily capture the human eye by contrasting to the surrounding words. For example, to abide by this fact, I added “up to 500 words” to our content gig, but this can be applied to any niche. Actually, all of our gigs have numbers in them and it’s not by accident. The last and probably most important thing that you need to add to the gig title is the absolute most important keyword that you have found – that is the keyword that you wish and someday hope to be on first place for. Of course, the closer it is to the beginning of the title, the better. After creating the gig title, I’d go straight into the gig description and skip the media part of the gig i.e. the images and the video – those will be created later once the content of the gig is final. Now, with the gig description, you have a lot more freedom than with the gig title – you have a total of 1,200 characters allowed and even a few styling options with no limit on uppercase words. A lot of bullet points – they won’t preferably be bullets but some special characters from the character map such as stars, ticks, etc. Short sentences – simply and understandably explain what your gig is all about. Styling – key points in the text should be in bold or even capitalized. Fiverr also allows you to add a yellow background to even further spark out the most important parts of your gig description. Separation between the paragraphs – do not stick together the content, because that way, it is harder to scan. Call to action – your gig description should always end with a call to action sentence. Flawless English – this is not the same situation as with the gig title. The gig description should be written in flawless English as if created by a native English speaker. Remember that most buyers are native English speakers and that will leave a great impression on them, especially when we consider the fact that most, if not all, surrounding gigs look like they’ve been written by a 4th grader. Strong adjectives – include words that empower your services i.e. “flawless”, “legendary”, “high quality”, “highest level”, “perfect”, “next level”, “maximum”, you get where we’re going with this. Also, you’d preferably want to put these in capital letters and also bold and/or add the yellow background to them. If you don’t know where to start with the content, simply model one of your top competitors. Take their gig description and use it as a skeleton to write your own gig description. Do not, of course, copy and paste the text as it is – that won’t get you far. Overall, you want your description to quickly and easily explain what your gig offers, why it is so great, and last but not least, what is required from the buyer. This last part will save you a lot of time, because there are countless clueless buyers on Fiverr that need absolutely everything explained so instead of them sending you a message asking about the gig or worse – leaving your gig because of something that was not clear to them – you can simply state, at the end, what each buyer is required to provide. And basically, that is all there is to the gig description. One last thing that we forgot to mention is to always use the full 1,200 characters allowed by Fiverr to insert as much target keywords as possible. Of course, do not stuff them like crazy, but simply include them throughout the gig description naturally as you would in a real text. This one is pretty simple – you would either use the same tags as the gig that ranks in first place for your target niche, or you would combine the tags from more than one top ranking gig in said niche. It all depends on your gig and how different it is from the others and which tags would suite it best whilst still being used a lot by other people. The final alternative you have is to add them using your own main keywords and the suggestions that pop up once you write them into the tags input field. You can specify a maximum of 5 tags, so specify wisely. After you are done with the gig tags, you are basically done with the entire content of the gig. However, there is another text that will appear on each of your gigs’ pages and should not be overlooked – your Fiverr profile about section. Oh yes, inserting your main niche keywords in there is beneficial as well as we saw, so make sure you don’t forget to do it. This is where all the fun begins. At this point, the content of your gig is finished and perfected to the letter, so now, let’s take care of the visual part of the gig – the images and the video. If you ever thought that you could skip one or the other, you are strongly mistaken. The thumbnail of your gig that shows up in the SERPs need to attract Fiverr buyers like a moth to a flame. Adding a video to your gig is an absolute must and it’s not just me saying that, it’s Fiverr itself: “Did you know that sellers who present their services in a video sell 220% more?”. Now, the first thing you need to do is come up with the lines that need to be said in the video. How do you do that? Well, when we were creating the videos for our gigs, we looked at all the top ranking gigs in our niche that had videos (most of them did). We observed what they said and what they showed in the video itself. And then, we came up with our own better versions of everything. One thing you should know is that you are obliged by Fiverr to include a sentence in which you explicitly say that this service is exclusively offered on Fiverr – otherwise, your video won’t get approved. Now, after you’ve checked out your competition’s videos, and you have a general idea of what you are going to say in yours, before you get to writing, you should understand that a Fiverr video should generally be less than 1 minute (as is the rule) – there are longer videos on the platform, but they are on top rated sellers’ gigs and I don’t really think anyone would watch a gig video for longer than a minute. Start out with a greeting – “hey guys”, “hey Fiverr”, etc. Explain what your gig offers – don’t go into extreme detail, but rather, focus on the absolute best things that your service provides to buyers. Miscellaneous words – of course, every niche is different and has its own unique sentences that should be said. For example, if you are creating a link building gig, it would be a good practice to include something like “this gig is 100% Panda and Penguin safe”, or if it is a writing gig, you should say something like “if you are not happy with our work, then we will re-write it for you until you are 100% satisfied”. Exclusively on Fiverr – we already explained about this part. Call to action – the video should end with a call to action sentence that leaves the viewer with a huge want to order. Of course, don’t just say “buy now” or something like that, but explain, in one sentence, why they should buy: “Order now to skyrocket your rankings tomorrow!”. You could also insert the angle of time urgency i.e. “So, what are you waiting for”. In any case, the call to action should be extremely powerful. Overall, the text of your gig video should leave the viewer with the feeling of professionalism and superiority of your service over your competitors’ even though you did not mention the too obvious “we are better than anyone else because…” statement. A great service does not need confirmation by its creator – it’s great because it’s great. Do it yourself – this is what I recommend but is only viable if your English is flawless . You can hire a friend – If you have a friend who fits the job perfectly, you can ask them to do it. This option is better because you have more control over the environment of the video i.e. background, number of takes, control of the emotion of the video, etc – we will talk more about this in a minute. You can hire an actor – I would do this only as a last resort for two reasons: number one is the fact that you don’t have the aforementioned control over the environment of the video and while most people who make videos on Fiverr offer many options as a background, the end result is still not something I would call professional, and number two – a lot of people have probably used the same actor for their own videos and that just screams low quality. I can’t tell you how many videos have popped up in my news feed with the same guy promoting different businesses and let me tell you this – it leaves a very bad impression. So, use this option only as a last resort. You are creating a brand here and standing out is a fundamental part of a respectable brand. Create a whiteboard video – the last option to have, which is quite popular at the moment, is to create a simple and effective whiteboard video. There are a lot of sellers on Fiverr offering such services and I have to say, some videos turn out to be pretty great. And also, you won’t have to deal with cameras and setting up the stage for the video which requires time and effort. Now, out of all the options above, I would say the best one is that you shoot the video yourself, but again, your English must be at a professional level. Understand this: no one else can promote your services better than you can, because no one else cares for the success of your services as much as you do. I discovered that when I tried to hire someone else to be in front of the camera instead of me and the emotion and energy that I wanted to achieve was just not there. Why did I try with someone else first? Well, it’s not that my English is bad, but rather, I wouldn’t call myself the most photogenic person in the world. But, I saw that things wouldn’t work with the other person, so I decided to shoot the videos myself – end of story. Now let’s talk video environment. If you take a look around Fiverr, you’d see that most videos are low quality and just something that was put together in 10 minutes to comply with Fiverr’s request that “videos sell 220% more”. But, Fiverr forgot to mention one thing in their video note – “good” videos sell 220% or even more, not just videos. There are great gig videos on Fiverr, but most of them are not something you want to mimic 100%. So, this is of course, only in the case where you or a friend will be in front of the camera and you have control over what the video will look like. Now the biggest reason why you have to put something in the background of your video is because of that thumbnail. Fiverr will select a certain moment (which you can choose) from your gig video and use as a thumbnail to be shown in the SERPs. As we already said, Fiverr buyers scan everything extremely fast and move on, so you want to have a thumbnail that would stop them in their tracks and grab their attention. If it were just you in front of a white screen or something, that is not what I would call a strong flow breaker. You want something that would disrupt their flow and shift their focus onto your gig. And this is exactly why I recommend using a person in the video, because a whiteboard video’s thumbnail is not something stunning to the human eye. But, a human being is something else, especially if caught in the midst of an action i.e. explaining something, pointing at something, etc. Now aside from the actor being in an engaging pose, the background of the video should also be flow breaking. And what captures the human eye? Colors. Something must be happening behind the actor that is mysterious which would rise the curiosity of everyone who sees it. For instance, you can see Fiverr videos with some drawings in the background, some formulas, writings on a blackboard, etc – those are good examples. When we were creating our gigs, we wanted to use something unique and not just copy what other top sellers were doing. It took me a few hours of thinking and research, but I finally decided to use a flip chart in our gig video backgrounds. It was just perfect – not only was it a unique idea and I had not seen another video on Fiverr with a flip chart, but it was also useful, because I could draw anything I want on it and further increase the flow breaking powers of our gig thumbnails. Not only that, but when I went to buy the flip chart, it came with this board which at first I thought I would throw out. However, it came to my mind (somehow) to implement this board into the background of the video as well – by sticking a bunch of important life words written on colored square papers onto the board. Then I taped it to the wall and used my “master” drawing skills to create a masterpiece for each of our gigs on the flip chart. The end result? The human being from the image above is actually not me, but my brother who I think is much more photogenic and has a much better English accent than me – he agreed to shoot the legendary SEO content gig. But overall, this is an aesthetic thumbnail that, at least in my opinion, has very strong flow breaking powers. I am more than certain that the effort I put into creating these videos has paid off a lot more than I thought it would and that much of our Fiverr success can be attributed to them – not only because they ensured high CTR for our gigs, but also, because they filled our buyers with a feeling of professionalism and I have had numerous people confirm that. Now, I can’t tell you exactly what you need to do for your video nor can I give you any specific steps to follow, because each niche is different and because there are just too many ways to make a video. But, the general effect you want to achieve is like the one from above. Honestly, I have yet to see a video that grabs my attention more than our gig videos. As I said, there are great ones, but each and every one of them has one or more weak points. The last thing you want to add to your gig video is a catchy background melody. The power music has over the human mind is just undeniable – especially over the emotional side of a person. You want to add a melody to your gig video that would put the mind of the listener at ease and subconsciously switch them into a mood for buying. If you don’t know where you can find such melody, just look around AudioJungle. Once you have the two parts of the video – the video and the background music, you can use Windows Movie Maker to put it all together. Lower the sound of the background melody to the lowest possible so that viewers can actually hear what you are saying. Export the video for YouTube and you are good to go. Watch it again of course to make sure everything is as it should be, and then name it. Now, I don’t really know if the file name of the video influences Fiverr’s search engine, but if I were you, I wouldn’t take any chances. Name the video something appropriate and again, reach to your keywords list from earlier and throw in a keyword or two in the video file name. We know for a fact that YouTube takes into account the video file name when constructing its SERPs so even if Fiverr is not doing it yet, it most certainly will in the future, because basically, it models bigger and more advanced search engines. For all of our gigs, I also added the brand name as well into the video file name, so the end result was something like “Legendary SEO Content By Inet Solutions” – you get the idea. And that’s basically it for your gig video. I know it’s a lot and I know that you most probably don’t want to invest so much in a video, but trust me, the ROI is there for the taking. Snapshot the best moment of the gig video – this one is recommended because the main gig image is used, rather than a thumbnail of the gig video, when Fiverr promotes your gig to its mailing list. So, you want to achieve that flow breaking effect again and after you put so much effort into the video, it’s only natural to use a snapshot of it as the main gig image – that’s exactly what we do as well. Create your own images – you can use Piktochart for example, to release your inner artist and create something outstanding. This is also a great choice, but I’d prefer the first one any day over it, just because there is a person in the image. Get some images from the Internet – this one is a last resort and not recommended at all. We actually also used (in the beginning) images from the net, but when I saw just how many gigs had the same damn images, I removed them instantly and went with option number one. Again, it’s just not professional to use something that a hundred other gigs are using. Of course, there is the scenario where you have a whiteboard gig video instead of a real “short movie”, in which case it would probably be best to go with the second option from above since whiteboard videos don’t have the greatest of thumbnails. Now, adding at least one image is absolutely mandatory since the first one becomes your main gig image and will be shown on places where Fiverr ignores the video thumbnail. As for the remaining 2 spots left, you can skip them and in my opinion, it’s not absolutely mandatory that you fill them in. What you can use them for is to illustrate some gig extras that you offer like we do with our more advanced SEO package. So for instance, gig image number two can be used to illustrate a gig extra for $20 and gig image number 3 can be used to illustrate a gig extra for $50 – something like that. Always make sure to create images that comply with Fiverr’s gig image size which is 550×370, because otherwise, the image will be cut to fit the container and there is no full image preview on Fiverr. That concludes the gig images part of your gig. Service explanation – you can create a PDF explaining in full detail what this gig offers. Work examples – you can create a PDF portraying some of the great work done by this gig. Gig extras – if you are offering complex gig extras, you can fully explain them in a PDF file, because the gig image has limited dimensions as we saw. Bonus – you can further tingle the curiosity of your buyers by writing a simple preface of a free e-book that they’ll get with each of their orders i.e. a lead magnet. Results – you can include a huge list of successful results that clients have had with your gig be it increase in rankings, awesome feedback, jump in sales, etc. And that’s just off the top of my head. Who knows how many things I haven’t thought of – after all, you can put a lot of content into a PDF file. Fiverr does limit the PDF to 3 pages as far as I remember, but that’s more than enough space to work with. And that brings us to the end of our perfect Fiverr gig creation. I know it’s a lot more than you probably thought a gig takes to set up, but if you want to make money from Fiverr, you have to put in the hours. A regular gig that would get nowhere can be created in 10 minutes, but if you want to actually get somewhere with your Fiverr business, you have to do it right – and the steps above will lead you on the right path. I remember that when I was creating our gigs, it was taking me like 2 to 3 days to put everything together – niche research, keywords research, writing the gig content, drawing on the flip chart, coming up with lines for the video, all the way down to hitting that “Save & Continue” button. But even then, you are not done – you still have to fill in gig extras and upload the video. Facebook – post the gig to your profile, on your friends’ timelines, in absolutely every single Facebook group that is relevant to your niche as well as all groups that have the word “Fiverr” in them. Create a page for your business and post there as well. Facebook is one of the social media sites where you want to post on a daily basis – every single day, go out and post to all of the groups that you have joined. Also, do not stop joining new niche relevant groups – you probably won’t ever join all because there are just so many. Twitter – share the gig on Twitter regularly and start replying to anyone who has created a tweet that is relevant to the services provided by your gig. You can automate this process using FollowLiker or BuzzBundle, but it’s not that hard to do it manually either. Google Plus – while G+ is not nearly as active as Facebook or Twitter, it still has a lot of people on it which will bring great exposure for your gig. The process on G+ is identical to the one on Facebook – join each and every niche relevant and “Fiverr” containing community and post your gig in them. What you can also do is share the gig on your own G+ profile page and then +1 every single post in every community that you have joined which will bring a lot of people back to your profile and ultimately, to your Fiverr gig. LinkedIn – again, the same routine as with FB and Google Plus – join as many niche relevant groups and groups containing the word “Fiverr” as possible and share your gig there. Share it on your profile too. Behance – create a project for your gig and add strong content to it. Use the same representation you used for the gig on Fiverr. Dribbble – if you have a designer gig going on, share it there. Flickr – create an account, upload your main gig image and link to your Fiverr gig in its description. Instagram – same as with Flickr – upload the main gig picture and link back to the Fiverr gig in the description. Also, link back to your Fiverr profile in your Instagram account description. Pinterest – create a board and pin your gig in it. Reddit – if you have a strong account there, you can drive tons of traffic almost instantly. If you do not have enough karma, you will have to comment a bit, up-vote other posts, etc. Then you need to find all niche relevant subreddits and share your gig on each of them. Don’t just place a link, but rather, create a post, explain your service, and then leave a link to the Fiverr gig. Reddit also has a “forhire” subreddit where you can surely get some leads. YouTube – upload your gig video to YouTube and make it look great using this tutorial. Link back to your Fiverr profile from the channel page and also, put a link back to the Fiverr gig in the video description. Use the word “Fiverr” in the gig title. Comment on other niche relevant YouTube videos with a link back to your Fiverr gig. Diigo – bookmark your gig on Diigo. Delicious – bookmark your gig on Delicious. Xing – this social network is similar to LinkedIn so the actions you will take there are almost completely identical – join communities and post inside. VK – the Russian Facebook is also a great place to share your gig – identical actions to FB. Blog comments – I have to say that out of all the promotion channels, blog comments are the most effective ones. They drive a lot of people to our gigs and they also make a ton of views. What you need to do is simply find niche relevant blog posts and post a comment there with a link back to your gig. We use BuzzBundle because it just makes it so easy to achieve that – all in a single user interface. Yahoo! Answers – for this one you can use BuzzBundle which will gather keyword relevant questions into one interface instead of you going out and searching for questions manually. Niche relevant Q&A site – there are also more specific Q&A sites that target only specific niches, so if yours falls into the category of such, use that as well – check out this post. Fiverr’s forums – you can drive a lot of views and potential buyers from Fiverr’s forums. But, keep one thing in mind – don’t be one of the “check out my awesome gig and buy it” people, but rather, engage in relevant threads and whenever it seems appropriate, link back to your gig. Fiverr’s forum also has a gig promotion section, but it’s mostly spammed by the aforementioned “great” marketers. Niche relevant forums – aside from Fiverr, you should also post on niche relevant forums. Now, this can take quite a lot of time, because if the forum is serious, it will probably have a minimum post requirement before you can add a link back to your gig. But, it is well worth the effort. An active forum can drive hundreds of visitors per day to your gig page without breaking a sweat. Website – you can go the extra mile and create a full website especially designed to promote your Fiverr services. You can create a few niche relevant blog posts and then link back to your gig – nothing new here. And those are basically the channels where you need to promote your gig. Can you imagine how much traffic that is if you actually do this on a daily basis? Sure it will take a couple of hours or more, but it will be more than well worth it once those orders start pouring in and you taste the feeling of making decent money from Fiverr. Just think about it: If you manage to drive just 100 visitors to your gig using all the channels above which is modest to say, and your gig converts at around 5% (remember how we perfected it so this is not a long shot at all), that’s 5 orders per day of at least $5 each – some buyers might order gig extras as well. So 5 daily orders at $5 each equals $750 per month. Now that’s not too bad right? And with all this activity going on around your gig, it will most certainly climb in the SERPs as well and Fiverr will start giving it its fair share of traffic – boom some more orders. And all this thanks to the huge amount of effort you put into the creation and promotion of your Fiverr gig while at the same time most sellers will still be wondering why they get 5 orders per month. The promotion process of your gig will not stop until it gathers a decent amount of reviews and starts getting a steady stream of orders from Fiverr on a regular basis – first you will be seeing a few days a week without orders, then just one or two and then there were be orders pouring in every day as your gig becomes more and more popular. At that point, you will probably feel that the gig is now a self-sustaining money making machine and you will stop the promotion. If things go well, good for you, if not, you simply begin promoting again, until you get to that point. It’s just so simple. What we laid out here today is basically a blueprint to making money on Fiverr. And it’s not that hard. I mean, if you were expecting to just sit around and have the orders pour in, then yes, it is much, much harder than you thought. But, if you were actually thinking of putting in the work and you were just a bit lost as to how you would go about making money from Fiverr, now you have a step-by-step tutorial to guide you. And it works – we have followed these exact same steps to get our Fiverr account to where it currently is, which in my opinion is not too shabby at all. We saw those same opportunities portrayed here that made us create this profile and now you are also aware of them – yes, they are still existent. 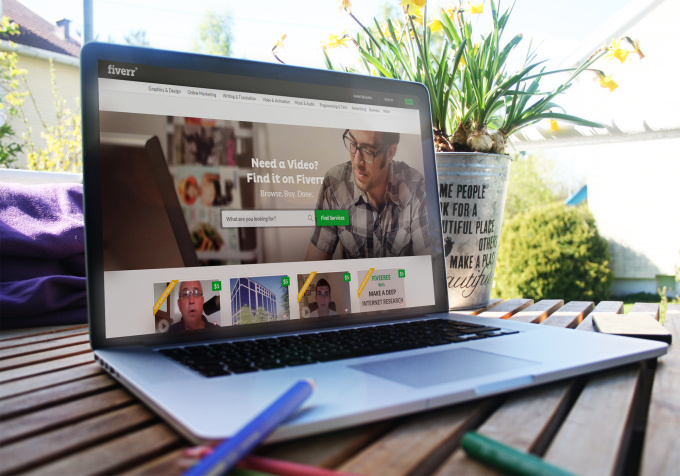 If you have ever had doubts about starting out on Fiverr, you now shouldn’t have any. Follow this make money on Fiverr blueprint to the letter and you’ll see for yourself just how easy it is. Hi. Let mi digest your speech (which I found intriguinly interesting) and we´ll be in touch. Thnx+Best. Try to answer me in… Spanish. What exactly do you want me to answer? Mate, I don’t know Spanish. accidentally i came to your site and it is more helpful from even the youtube videos. You have described too much clearly about the mistakes which are needed to be improved you are new or already experienced on the Fiverr though. But i am here to call you for a help indeed, i just registered to Fiverr a couple of days before and i need to improve my self as a even a standard seller. Please help me how can be a standard earning seller, looking forward for you kind and prompt response, thanks. I have experience with Fiverr yes. As for your improvement mate, just follow this guide to the letter and you will be fine. :) It’s what I did and it worked out pretty well. Awesome tutorial! If I am going to do something, (achieve goals), I want, have to do it right! Why waste time being ineffective? I will make my mistakes, most assuredly, but thanks to people like you (who made their mistakes), sharing their knowledge I know where to begin in putting my plan into action. I needed a launching pad, and you provided me one with endless opportunities, dependent on my efforts, of course. I wanted to show my appreciation in some way, and I hope this mention, as tiny in comparison, expresses it, sincerely. Thank you so much for this. I appreciate it a lot and I wish you the best of luck! These are great points to implement. I think the most important part to get order is gig image, description and title. we have to make it as good as possible. with lot of competition on similar services we have to promote gig to get sales. Like this a lot…. Critical study of this post does not mention or explain any platform or methods of promoting gigs… I think the poster should review the post..
Those are in the section which you need to unlock with your email. Thank you for sharing this information. I am a level 2 seller on Fiverr myself & would suggest specifically students to start working on fiverr to make such side income. Thank you! Thanks for the posts. 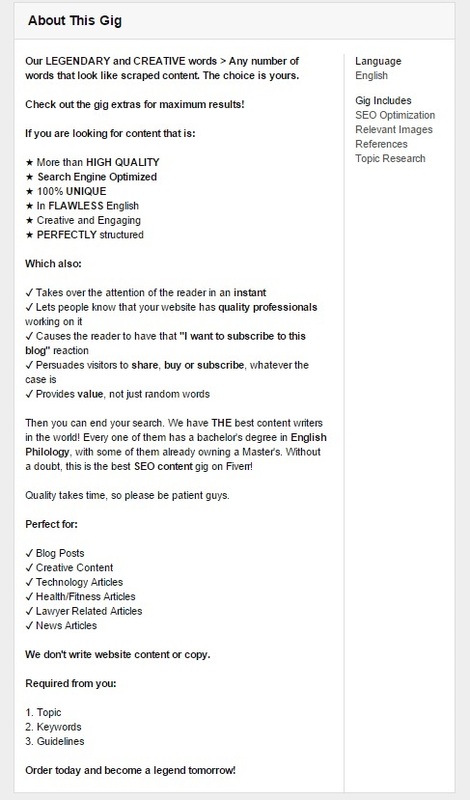 I recently just created a fiverr account and I’m definitely going to apply ALL OF THIS! I was wondering though, in terms of creating short niche relevant blog posts on the Web 2.0 sites and commenting on relevant blog posts. As a copywriter do you have any suggestions on what type of blogs and posts I should be searching for? Do you think on subjects I love to write about, copywriting specific blogs and posts or anything else? It is a benefit if you post on niche-relevant websites, but as long as you can twist it, it will be OK for your Fiverr backlinks. Doncho, you aren’t worth your weight in gold, but in Perfect Diamonds. I’ve bought 2 of the best selling, top-rated courses on Udemy on freelancing, one of them is specifically about Fiverr. Your article has easily offered 10 times more value than even the better, 5,5 hours long, very thorough and high-value course. NONE of them has put my mind completely at ease about my ability to succeed on Fiverr, at all. Your writing, on the other hand, has gifted me a Zen-like peace of mind and certainty that I can succeed with ease, straight away. Talking from my personal experience with the best selling courses on Udemy about freelancing (and no doubt, this will be true about SEO as well), if you were to create your own courses there, you’d blow every single competitor out of the water, like an epic submarine sinking warships, explaining information gained from such depths that no one else has access to. This is intriguing, I was actually looking for this for a long time and most of them would rather have me pay for a poor value. Thank you so much for sharing these wonder tips with us. I know my flaws now, thanks to you I can now go on and set my records straight.